Before the flood, God sent Noah to warn the world, so people could be led to repentance and escape the coming destruction. As Christ’s second coming draws near, God is sending His servants to warn the world to prepare for that great event. In June, I left my home in Davao with a few brethren and traveled to Antipolo, Manila, Philippines to lead a public crusade. The journey was an adventure because of the traffic. The roads are full of jeepneys and other vehicles, and it takes many hours to get there. On the first day after our arrival we did groundwork in the area, along with the active members of the local church. One of those members is 75-year-old Sul Africa. Before becoming an active layperson in the church, he worked as an evangelist for almost 20 years, and he and his wife are still hard at work. Because of his sincerity, many souls have accepted Christ. He did not receive support from the corporate church, but continued his service using the funds he receives from his government stipend as a retiree. 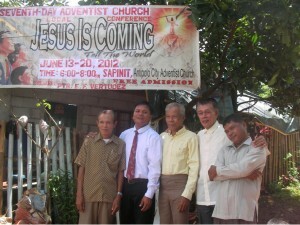 He helped to nurture 16 churches in Manila. Although he had to leave his station because of the apostasy there, he continues spreading the everlasting gospel and has been working with us. 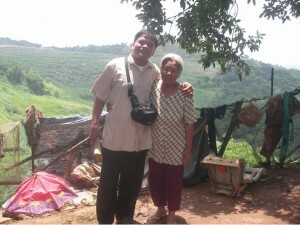 As part of our groundwork, we visited the entire area, and I found that the people are very busy. They work hard, picking their daily income from the garbage every morning. They find things that can be sold and earn only about 120-150 pesos per day (about $2.90—$3.60 US dollars). As I asked about their beliefs, I discovered that most of them follow the Iglesia ni Cristo denomination. This group believes that God created Jesus and that only church leaders are authorized to read the Bible. On the second day, we continued visiting from house to house, inviting people to listen to God’s Word, and by God’s grace, they were interested in attending the meetings. We spent a lot of time laboring and seeking for those who are longing for Christ. One day, we were visiting a member of the Iglesia ni Cristo and found out that her child was sick, so I advised her what she could do for her child, and with the Lord’s leading, the child recovered within three days. When this happened, their hearts opened, and they listened and wanted to have a Bible study every day. These people had been members of the Iglesia ni Cristo since birth and did not know how to find anything in their Bible, and now they are believing in Christ as their assurance of salvation and attended the crusade. After a few days, Sul and I were stunned when this woman’s mother began to confess about her work, stating that she used to be an abortionist and now worked as a medium with familiar spirits. This work provided her daily financial support. She was almost 85 years old, but she looked younger because she followed healthful practices. Even though her church leaders did not teach the distinction between clean and unclean, she would not eat unclean animals or other harmful foods. She fearlessly asked me, “Can God pardon me for all the things I’ve done?” She wanted to have a good answer from the Bible, so I shared with her Isaiah 1:18 and 1 John 1:9. After I read God’s Word, she opened her heart and asked me to have a prayer for the forgiveness of sin through Jesus Christ. Afterward, she looked to heaven and praised God for the forgiveness, the cleansing of her heart, and for the wonderful privilege that God had given her. Just before the crusade began, the weather was lovely, and we could see the moon and stars shining each night. But on the first night of the crusade, a typhoon hit. It was terrible because the area where we were conducting the crusade was the first place hit. The rain was heavy and intense and the wind was powerful through the night and day. Many homes were destroyed because of flooding, and hundreds of people got sick. One of the brethren suggested that we might not be able to continue the crusade. But I said that this work was not ours but the Lord’s, and I knew that He would send thousands of angels to protect us and hold back the typhoon so that we could continue to spread the everlasting gospel. We prayed for guidance and help. I knew the typhoon came from Satan to destroy the Lord’s work, but I also knew God’s hand is mighty to save. After the prayer, He gave us assurance and strength to continue the work. The very next day, in a big surprise event, the typhoon left us, turning to another place. It was my first time to witness that kind of miracle, and I praise the Lord for His wonderful work! From the first night to the last, many people were blessed by the message and were willing to follow Christ. By God’s grace we have six souls who will be baptized. After the crusade’s end, we decided to return to Davao. Brother Sul Africa will continue nurturing the people, especially those who are interested and willing for salvation. We pray together for the work here and in Manila, for the Lord to continue to support it. “God’s people must take warning and discern the signs of the times. The signs of Christ’s coming are too plain to be doubted, and in view of these things everyone who professes the truth should be a living preacher. God calls upon all, both preachers and people, to awake.” Testimonies for the Church, Volume 1, 260. By Edmar Vertudez. Support for the work in the Philippines can be sent to Mission Projects International, PO Box 59656, Renton, WA 98058.